As Upper King Street continues along its path of revitalization, much is said of hotels, condos, and office space. 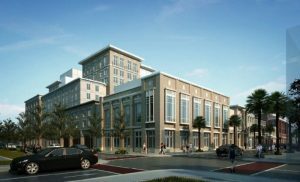 As developers rush to fill every square inch of the once dilapidated area in the center of the peninsula between King and Meeting Streets, City of Charleston has worked to keep focus on the character and livability of this burgeoning district. The original Downtown Plan, developed in 1999, outlined a vision for taller, denser buildings in the peninsula’s midtown, but current visionaries in the City’s Department of Planning, Preservation & Sustainability identified a missing factor: green space. A principal feature of a well designed, livable community is the incorporation of green space, and the City is looking to stake its claim. At the center of the frenzy of current and future development is the lot bounded by King, Columbus, and Spring Streets, and the old rail line. Across Spring Street the Midtown development towers above, and across Columbus Street, the Post & Courier building holds its ground. The parcel is currently occupied by The Alley, a popular event venue with a bowling alley and vintage arcade games, and a U-Haul franchise with several moving trucks stationed about (worry not, Alley regulars and U-Haul reservation holders, we’re still talking long term here). The positioning of the parcel is ideal for use as a public square, at the intersection of major streets and adjacent to the proposed Lowcounty Lowline urban greenway. “It’s an A-plus place” remarked Tim Keane of the City’s Planning Department, who explained that the City is not aiming to purchase the land, but at this point is aiming to define the next use for it. The two acre site would likely be a true gathering space, perhaps like a smaller version of Marion Square, with an open space for events, placement of a fountain, peppered with trees and walkways throughout. 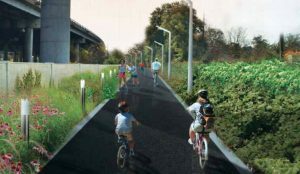 Its position along the decommissioned railroad lines would be the perfect opportunity to incorporate the proposed Charleston Rail Line Linear Park, also known as the Lowcountry Lowline, that would run about 1.5 miles from Mt. Pleasant Street to this public square or beyond. A city park here would serve not only patrons of the shops and restaurants of Upper King Street, but also the residents of Cannonborough and the adjoining Westside and Eastside neighborhoods. 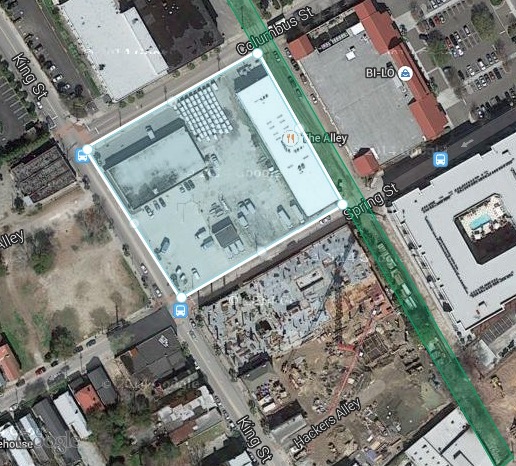 The Lowcountry Lowline greenway would further connect the North Central and East Central neighborhoods to park as well.